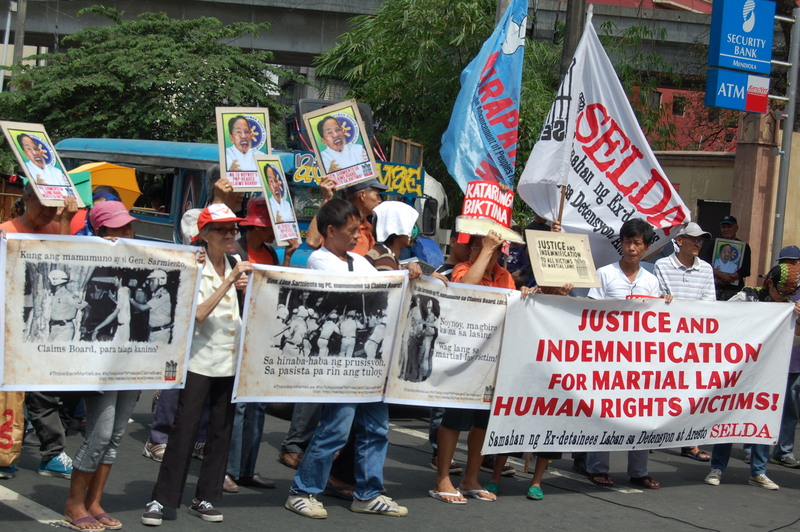 Members of the Samahan ng Ex-detainees laban sa Detensyon at Aresto (SELDA) together with the surviving victims of human rights violations during martial law and their relatives trooped to Chino Roces (formerly Mendiola) Bridge to express their grievances and assailed the continued inaction of the Aquino administration in implementing the Human Rights Victims Recognition and Reparation Act of 2013 otherwise known as RA 10368. President Benigno Aquino III signed the Human Rights Victims Reparation and Recognition Act of 2013 into a law in February, in time for the 27th anniversary of EDSA People Power I Uprising. 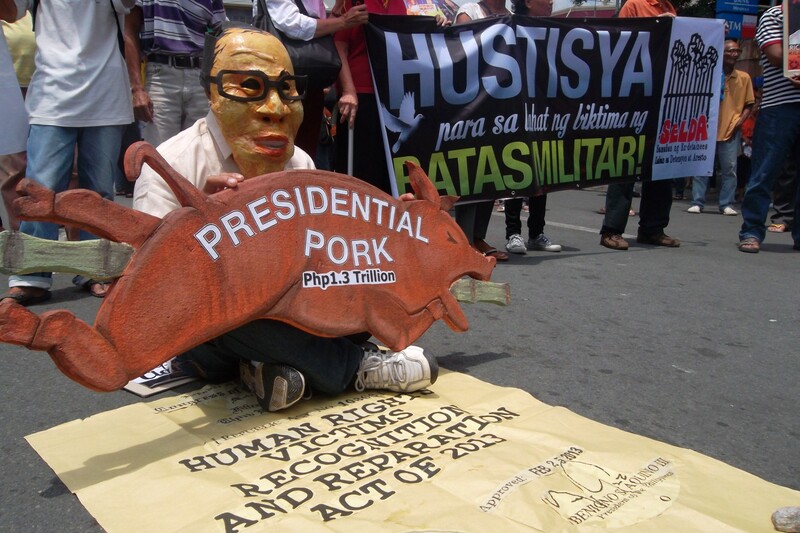 “To date, after almost seven months, the law has not been implemented because since its signing, President Noynoy Aquino has not appointed members of the Human Rights Claims Board as stipulated in the law. The Human Rights Victims Claims Board shall process, evaluate and approve application for claims of reparation and recognition. Further, the Implementing Rules and Regulations (IRR) will also be made by the board. Thus, without the Human Rights Victims Claims Board and its implementing rules and regulations, the law becomes inutile,” said Marie Hilao-Enriquez, chairperson of SELDA. MANILA, Philippines –President Benigno Aquino III on Monday signed a landmark law, compensating human rights victims of dictator Ferdinand Marcos, 27 years after a bloodless “People Power” revolution ended his reign. “Nilagdaan natin ang Human Rights Victims Reparation Act of 2013 bilang pagkilala sa pagdurusang dinaanan ng napakarami noong Batas Militar.” Aquino said in his speech during the country’s celebration of the 27th People Power Revolution. ”Hindi natatapos sa paggunita ang ating krusada para sa katarungan,” Aquino said. Aquino thanked Deputy Speaker Erin Tañada and Senator Serge Osmena who authored the bill, as well as Senate President Juan Ponce Enrile and House Speaker Feliciano Belmonte Jr. Ten billion pesos ($244 million) will be distributed to potentially thousands of people who were tortured, raped or detained, as well as relatives of those who were killed, by Marcos’s security forces during his 20-year rule. Aquino said the law was part of his government’s efforts to “right the wrongs of the past”. “We may not bring back the time stolen from martial law victims, but we can assure them of the state’s recognition of their sufferings that will help bring them closer to the healing of their wounds,” he said. Loretta Ann Rosales, an anti-Marcos activist who was tortured by his security forces and now heads the country’s independent rights commission, said the law would finally allow all his victims to feel a sense of justice. “The law is essential in rectifying the abuses of the Marcos dictatorship and obliges the state to give compensation to all those who suffered gross violations of their rights,” Rosales told AFP. Marie Hilao-Enriquez, the chairwoman of Selda, a group which represents Marcos rights victims, also welcomed the symbolic intent behind the law but said the money was too little to have a meaningful impact. “There are so many victims that when you divide it to everyone it will not result to much,” Hilao-Enriquez said. Hilao-Enriquez’s group represents about 10,000 documented victims but she said there were many more who had not been officially registered and may now come forward, such as Muslim communities in the remote south of the country. Under the law, a “compensation board” will accept and evaluate applications for reparations over the next six months, according to Rosales. The compensation money will come from about $600 million the government has recovered from Swiss bank accounts that Marcos secretly maintained while he was in power. The government has accused Marcos and his relatives of plundering up to $10 billion and has so far recovered about $4 billion. Aquino’s mother Corazon led the “People Power” revolution that saw millions of people take to the streets and force US-government backed Marcos from power. He died in exile in Hawaii in 1989. Sister Cres Lucero, 70, a human rights supporter, hailed the enactment of the bill into law. “Isang tagumpay ito para sa karapatang pangtao. Kasi dito talagang pinirmahan ng Pangulo natin ang Compensation Act para sa mga biktima ng martial law,” Cres said. She underscored the role of justice in the pursuit of freedom.